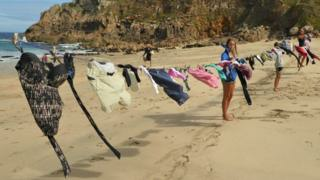 More than 60 items of clothing have been abandoned at a remote Cornish beach during the summer holidays. The garments were collected by volunteer litter-pickers from the Friends of Portheras Cove community group in July and August. The tally included 29 socks, eight pairs of underpants and six shoes. Volunteer Jan Trevorrow said: "People don't think of this as litter but it really is. It can pose an entanglement threat to sea birds and marine life." The garments have been displayed on a washing line to show the human impact on the environment. A group of 30 local volunteers are often joined by holiday-makers who come to the cove especially to help out with the beach cleans. Delia Webb, a marine biologist and member of Friends of Portheras Cove, said: "All the focus at the moment is on marine plastics, but clothing can be just as dangerous. "It's seal pupping season and they can easily get caught up in the clothing, especially elastic garments like underwear. "Whatever you take to the beach, please take it away with you." The clothes will be recycled or donated to charity.